With the thick of winter just weeks away, it pays to be prepared. Your Pekin and Peoria dealer for Rams, Vans, and Jeeps has provided you with the right vehicle for the ice, sleet, sludge, and snow. Sure, your Wrangler or 1500 may be the right winter weapon, but do you have all of the seasonal checkpoints crossed off? Without a doubt the worst time to have a vehicle issue is when it’s cold, wet, and slick out. With that said, below are some tips for preparedness to follow this winter season. You’ll be happy you checked these off your list this holiday season! Need some help? Schedule an appointment with our expert service advisors and technicians here at Uftring Chrysler Dodge Jeep Ram. 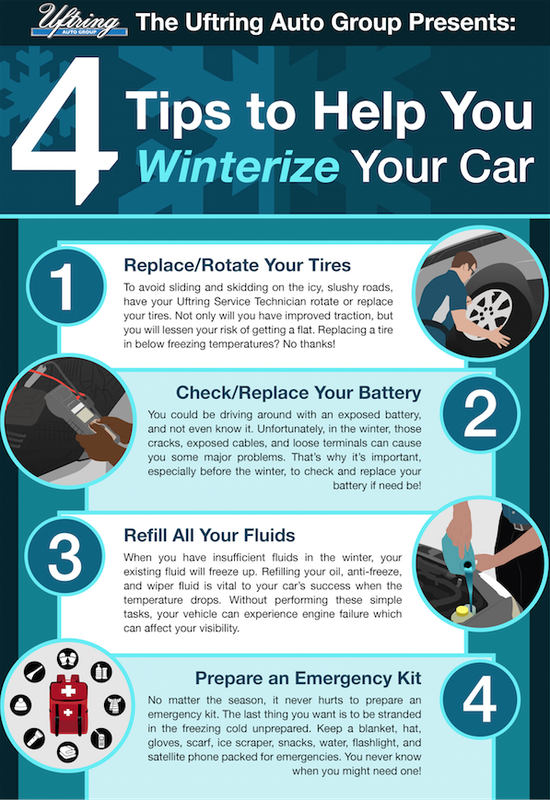 We’d love to help you prepare for the winter!